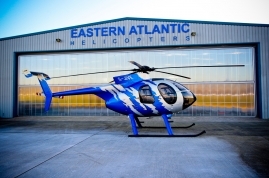 Eastern Atlantic Helicopters purchase pre-owned helicopters from around the world for stock. By the time we have the helicopter back at our hangar you can bet on the fact that we have concentrated every effort to ensure the helicopter is a sound purchase. We know exactly what to look for - we've done it over 200 times! We have a buying team that will travel the world at the drop of a hat to scrutinize any helicopter personally. Our inspection and flight test criteria is incredibly strict. We have extensive packing, shipping and import / export experience to ensure the helicopter arrives back here efficiently and without a scratch. "We've bought and sold over 500 helicopters!" If you are buying pre-owned from Eastern Atlantic, you are buying a thoroughly tried and tested helicopter. However, we still insist that each and every buyer carries out an independent pre-purchase survey of their own, which protects us and protects you and validates the helicopter is fully airworthy, all systems are fully functional and it is cosmetically as advertised. It's your right as the buyer to have this... don't waive it. If you're unsure about us or perhaps the idea of buying overseas... then we would urge you to contact one of our existing customers and ask them directly for their experience of buying or selling with Eastern Atlantic Helicopters.